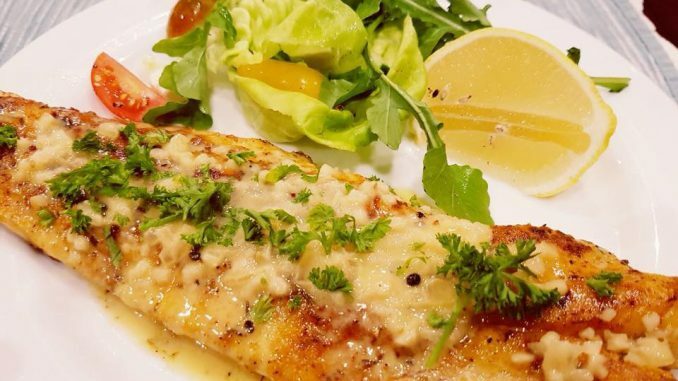 Here is something really special to spruce up that old tried and tested fish recipes. There are only so many ways to prepare fish and this elevates white fish to a completely new level of gourmet. The taste is incredible and served with a fresh green salad makes it the perfect dinner. 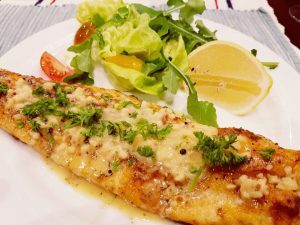 This is one fish recipe that you will make over and over again. Enjoy! Heat a large skillet over high heat. Add the wine, lemon juice, garlic, and shallots. Cook for 3 minutes until shallots are soft and sauce slightly reduced. You want to cook out the acohol. Stir in the salt, pepper, Worcestershire, and hot sauce and simmer until the mixture is somewhat syrupy, about 3 minutes. Mix fish spice blend ingredients together. Season the fish with half the spices by rubbing it all over the fish. Season the flour with the other half of the spices and dredge the fish in the seasoned flour, coating completely. In a large saute pan, heat the olive oil until smoking. Add the fish to the saute pan, pan-frying for about 4 minutes on each side. Start frying the fish skin side down. Leave it at least 2 minutes, then slowly lift with spatula to see if it’s properly browned and crispy. If it sticks to the pan, it’s not ready! Leave it. Turn over when ready and let it brown properly. The flavor is in the browning! Don’t be afraid of the fish! When its nice and brown use a fork to pierce and pull slightly to see if it’s nice and flaky. Then you are ready. Drizzle some lemon butter sauce on each plate. Top with fish and drizzle more sauce over top of fish (Don't overdo it! The sauce it rich). Top with fresh parsley. Serve with fresh green salad!